Are You a Champion of Environmental Literacy? Tell us your story and if you are selected we will acknowledge you as a champion of environmental literacy on our website, social media sites, and will send an official letter and certificate to your school and a press release to your local papers. We can’t wait to hear your stories!! Please submit your story on the Share Your Story Page send us photos that you have photo releases/permission to use. We prefer high resolution jpgs so we can include them in press releases. 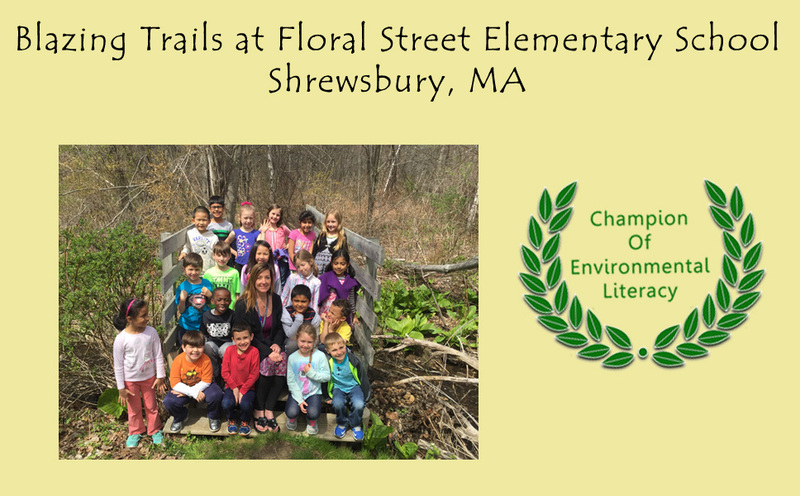 MEES is thrilled to acknowledge Kara Frankian and Floral Street Elementary as our first champion of Environmental Literacy in Massachusetts! Kara J. Frankian, a first and second grade teacher at Floral Street Elementary is blazing trails in Shrewsbury, MA. With the help of Eagle Scouts and community volunteers, they have built a half-mile loop of trail and boardwalk through the schoolyard’s wetland and woodland area. Ms. Frankian’s class spends time on the trail on a weekly basis tracking change over time, looking closely at budburst and leaf drop as inspired by Dr. John O’Keefe and Pamela Snow of Harvard Forest. Although four consecutive brush fires and vandalism have kept the school from formally reporting data to the Buds, Leaves and Global warming study, they still use a modified protocol to help children track change over time in a formal way. In addition to predicting, observing and documenting this change, the majority of the reading and writing standards are delivered through the lens of science as her students work and learn each day. Students even created QR codes to present their findings during their environmental celebration, Floral Goes Green on May 27th. Floral Goes Green showcases the beauty and diversity of nature, seeks to educate the entire 780+ student body and their parents about ways we can all live more sustainable, nature-friendly lives. It introduces students to environmental heroes such as Rachel Carson, E.O Wilson, Wangari Maathai, Theodore Roosevelt, John Muir, Vandana Shiva and many more. This year, Heifer, Audubon, Mosquito Control, experts from the ALB project and local organic farms will join in to contribute to an engaging day of learning focused on celebrating and protecting the environment. All 32 classes in grade 1 through 4 contribute some type of project based learning or research findings to add to the theme of the day. Not only do Kara’s students feel like leaders in shaping the day for Floral Goes Green, they are committed to maintaining the health of the trail. The school is even going beyond their borders and hope to have students collaborate with the Shrewsbury Farmer’s Market to better educate their community about the importance of a healthy environment.